Honore Depew of ECOS helps a student pedal fruit and juice into a smoothie. Southern Oregon University recognizes that the quality of a student’s college experience is not defined by GPAs or transcripts, but also by their level of involvement in their campus and community. There are 87 registered clubs at SOU, and despite their differences, they share the common goal of educating and inspiring students to take an active and open-minded role on campus. On Sept. 27 SOU hosted the annual Club Fair, where campus organizations gathered to promote their causes with booths, posters, and souvenirs. 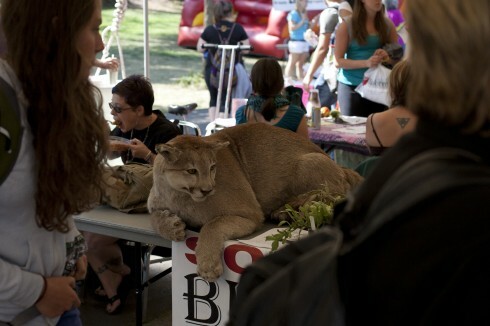 Most clubs at the Club Fair offer some sort of incentive for talking to them, but shock factor works, too—as this cougar illustrates. The International Student Association worked on encouraging students to learn more about world cultures. Their booth on Thursday was decked out with mini flags of nations from around the world. The goal is to “promote knowledge about the different cultures we represent,” said Sarah Looney, 19, of Ashland. She said the club has several exciting events planned for the year, such as a visit to Crater Lake, a Jacksonville New Year’s Parade, a team building retreat on the coast, and various other cultural celebrations on campus. The club meets every Wednesday from 5:30 to 6:30 p.m. in the Senate Chambers of the SU. SoUsign, the American Sign Language club, was also in attendance, encouraging students to educate themselves about Deaf culture on campus and in the community. The club welcomes people of all experience levels with an interest in ASL and Deaf culture to attend their weekly meetings on Wednesdays at 5:00 p.m. in SU 319. The club is currently working to approve closed captioning in all movie theaters in Ashland, and is planning several other major projects this year. Ashland Community Emergency Response Team was also present, advertising hands-on experience through workshops that will provide training in disaster preparedness, fire safety, disaster medical operations, and other basic curriculum. According to Eubanks, CERT is a national volunteer program that has partnered with SOU for the past three years, training students for future employment. The Ecology Center of the Siskiyous is one of the major resource centers on campus for anything and everything involving the environment. 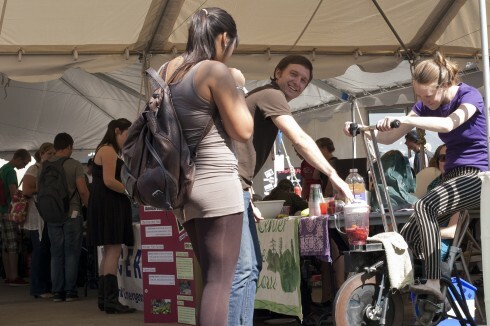 The club manages the community garden on campus, open to all students with an interest in organic agriculture, the university recycling program, serving to help students reduce their ecological footprint, and the Bike Program, emphasizing the importance of clean transportation. “We want to help all students have a lighter footprint and be socially responsible,” said Honore Depew, garden outreach coordinator. Other events the club is coordinating include bike art parties, a harvest fair, and a one hour garlic workshop in the SU on Oct 9. Regular meetings are held on Friday at 9:00 a.m. in the ECOS office in basement of the SU, and are open to everyone. There is never a lack of opportunity to get involved at SOU, given the amount of student clubs. For more information about student organizations in general or to see a list of all registered student clubs and organizations on campus, visit www.sou.edu/studentlife/clubs. 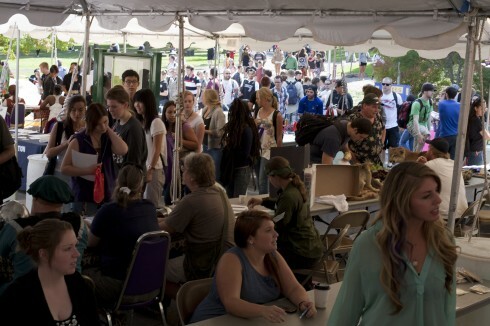 The Club Fair is always a well attended event.